This is a great, accessible read, that offers a map for those interested in picking their way through the minefield of press reports on China, ranging from the “China threat” myth perpetuated by some of the Western press and the “China is the best thing since sliced bread” line served up by China’s state media. I thought that it was a little inappropriate to contrast Chinese traditional art or furniture to Andy Warhol and concept art, as if that’s representative of Western tradition, but it sparked an interesting conversation with my friend and Yip raises some interesting points on the role of the artist and of religion in traditional Western art and how perceived individualism and collectivism impinges on artistic expression, although I felt his idea of Eastern tradition sounded a lot like Plato’s plane of ideal forms, despite my friend’s protestations that I just wasn’t understanding spacial dimensions of the Chinese word “境界” – which I think I translated as “aura” but could easily have been “paradigm”. … she was propelled by bursts of exuberance and impatience, as if she were channeling China’s industrial id. 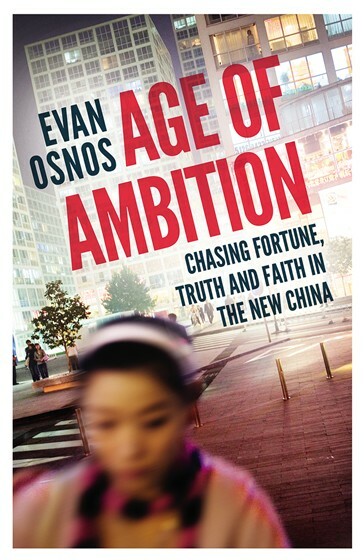 Osnos is very insightful and sensitive in his portrayal of all the people that he presents to us in his book, and they appear completely unvarnished, giving readers an insight into how high-profile figures in the West, like Ai Weiwei are viewed in China. He knows a lot of key figures in China’s art and media scene, which allows him to pepper the book with comments from figures from China’s literary and arts scene, like Wang Shuo and Jia Zhangke, while he still gives equal weight to the Chinese everyman and those whose ambitions were never realized. There’s an incredible range of facts in the book and lots of interesting detail, which give us the context to decisions announced dryly by the state press, and allow for a more rounded interpretation of the logic and aims of the Communist Party and what dilemmas they face as China continues to develop, along with the ideological impact of the choices they make, like the decision in 2002 to change references to the party from “revolutionary party” to “party in power,” for example. I was also fascinated to solve a question that I still remember from my third year course in Chinese at Leeds in the UK, when we translated a text with the term “bobozu” (波波族) and there had been a debate as to where the term came from, with one of my coursemates informing us that it was an acronym for “burnt out but opulent,” which didn’t seem very relevant to the China we had left the previous year. Osnos reveals that a satirical sociological book by David Brooks had been translated into Chinese a few years earlier called Bobos in Paradise: The New Upper Class and How They Got There and had become a bestseller, “bourgeious bohemians” being the “bobo” or “bubo” in question, although I still like my classmate’s explanation better. Osnos’ book is also very funny, with little tidbits of information that will have you chuckling, such as night schools teaching Chinese to spit liquor into their tea to avoid getting drunk when out with their bosses and the state-media accusing a Chinese nationalist blogger of being a fifty-center (paid by government to keep the public internet debate in line amongst other funny tales. A worthwhile read for anyone with even a passing interest in China who wants to understand what China is really all about, and the people that constitute its citizenry. The book is divided into the three sections that are the three things most discussed in references to China by outsiders – “fortune” referring to is now the cliched “meteoric rise” of China’s economy, “truth” dealing with the media in China and censorship, and finally faith, dealing with what people often refer to as the spiritual poverty of China, and how this is rapidly changing as China opens up and people look for something beyond the physical. This entry was posted in Best of Books, Book Reviews, Book reviews: English-language books on China, Home, Main, My Writing and tagged Ai Weiwei, anthropology, china, Chinese, Chinese Literature, communist party, CPC, Crouching Tiger Hidden Dragon, Evan Osnos, 葉錦添, 記者, human nature, Jia Zhangke, journalism, literature, nationalism, patriotism, PRC, reportage, spirituality, Tim Yip, Timmy Yip, translation, Wang Shuo, 書評, 本性, 欧逸文, 中國, 人類學 by ladenframe. Bookmark the permalink.